Decoder Format: 4K VP9 Video decoder, H.265/H.264 video decoder, 1080P other video decoders (VC-1, MPEG-1/2/4, VP6/8). Media Format: Avi, Ts, Vob, Mkv, Mov, ISO, wmv, asf, flv, dat, mpg, mpeg. Music Format: MP3, WMA, AAC, WAV, OGG, DDP, HD, FLAC, APE. [Android 7.1 Nougat OS] MX9 max runs on the latest Android 7.1 Nougat System which is perfect in productivity, stability and performance, along with various of features and optimizations, delivering an improved user experience. [RK3328 Quad-Core CPU] Powered by high-performance RK3328 Quad-Core CPU, MX9 max will be able to play 4K videos with H.265, H.264 and VP9 codecs. 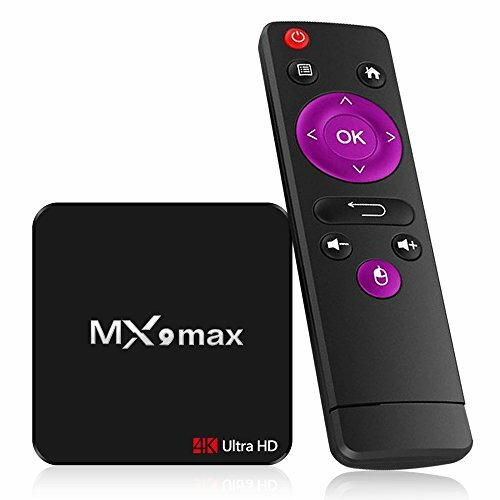 It also features HDR 10, HD 2.0a, USB3.0 and a Mali-450 GPU. [Storage & WiFi & LAN] Comes with 2GB DDR3, 16GB eMMC Flash ultimately delivering a richer using experience which runs Apps and games quickly. 2.4G WiFi and 10 / 100M LAN provides reliable network. If you have any questions about this product by Docooler, contact us by completing and submitting the form below. If you are looking for a specif part number, please include it with your message.